Which female superstar has the most chart-topping hits on the Billboard Hot 100? A. If you thought Madonna that would be a good guess but WRONG. It’s Mariah. Mariah Carey has topped the chart over 18 times in her career. Although she began as a pop star with a soulful sound, her leanings now is towards a contemporary R&B. Her current vocal style debuted on the album Butterfly which was released in 1997 and sold over five million copies in the United States alone. Carey said herself that she considers Butterfly her magnum opus. Mariah chose her beloved motif of Monarch butterflies to be included in her custom 5' x 5' Gold Series VocalBooth design. 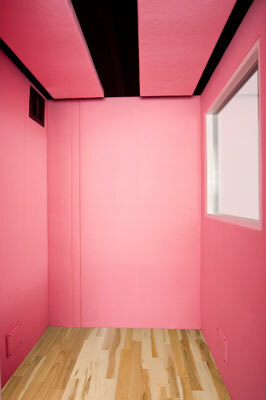 This was a fun project for us and our first pink (“Hello Kitty” pink to be exact) VocalBooth. It looked fantastic. The black exterior had a sophisticated contrast to the soft felt wrapped yummy pink interior. Just being in the booth made you feel like you were floating in strawberries and cream. The personalized initials on the door were also a nice touch. We heard from our “sources” that Mariah was pretty thrilled. How could you not be when you get exactly what you want—your own custom VocalBooth for your home recording studio that has a great sound and a great vibe.